Paperback L.A. Book 2 continues the engaging "Casual Anthology" series with genre-crossing writing gems, vibrant photo essays, and more. Memoirs, magazine articles, and magic realism all make an appearance. 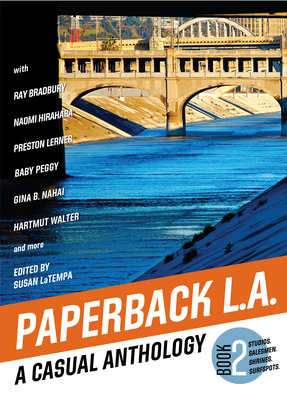 Contributors include Baby Peggy on Holly wood, Ray Bradbury on Venice Beach, Karen Tei Yamashita on freeways, Preston Lerner on auto racing, Naomi Hirahara on Terminal Island, Gina B. Nahai on the Persian Jewish diaspora, Ann Summa on urban cyclists, and Hartmut Walter on shorebirds. Editor Susan LaTempa has worked at L.A. Style, West Coast Plays, Westways, the Los Angeles Times, and beyond. Susan LaTempa is a Los Angeles editor. At LA Style, West Coast Plays, Padua Hills Theater Festival, Westways, The Los Angeles Times, and Liberty Hill Foundation, she's worked with journalists, playwrights, novelists, recipe developers, landscapers, photographers, and videographers. She's concentrated on addressing L.A.'s vast, cosmopolitan audiences, in the process helping shape dozens of memorable articles, reviews, memoirs, parodies, essays, theater pieces, and videos that have illuminated so many aspects of L.A.